High Profile Turntable 48” x 48: Squared turntable with chamfered corners makes loading by fork truck only much easier for operators. With a diamond cut top and caster drive system, other benefits include film holder for fast film attachment and the ability to wrap lower on the pallet. 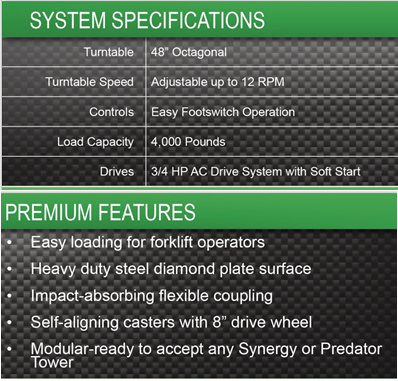 72” Turntable Top: Increased turntable surface for larger pallet loads, additional sizes available. Scale Package: Incorporating four load cells into our sub-frame will allow the customer to weigh every load wrapped. This option includes a sub-frame, the load cells, and an indicator (mounted to the machine mast) with digital readout and connectivity to computer systems or printers via RS-232. Push Button Stand: Replaces foot pedal operation.